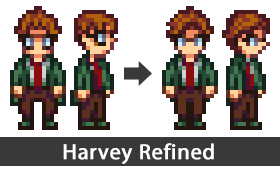 A refined version of Harvey's sprite with better face and hair. Also gets rid of the leg gap and other tweaks. All original art is credited to ConcernedApe, developer of Stardew Valley. Harvey is the next target for sprite improvement!! He's always looked monstrous and weird so I decided to beautify him. I edited his hair to be more accurate and also went with another approach to glasses. It worked out nicely. His jacket/coat has also been shortened and the coat tails removed (those suit Elliott more). 2/14: Also uploaded an optional version with a mustache as requested.
. This mod replaces the original Harvey.xnb sprite. Please make a backup of the original file if necessary.
. Unzip or extract the Harvey.xnb file after downloading.
. Place the file into the Stardew Valley folder under Content\Characters and replace Harvey.xnb.